Classmates laugh when a camera is pointed in their direction. No language necessary to understand the exchange. I make hand motions suggesting I want to take a photo. The three girls huddle together and begin to laugh uncontrollably. 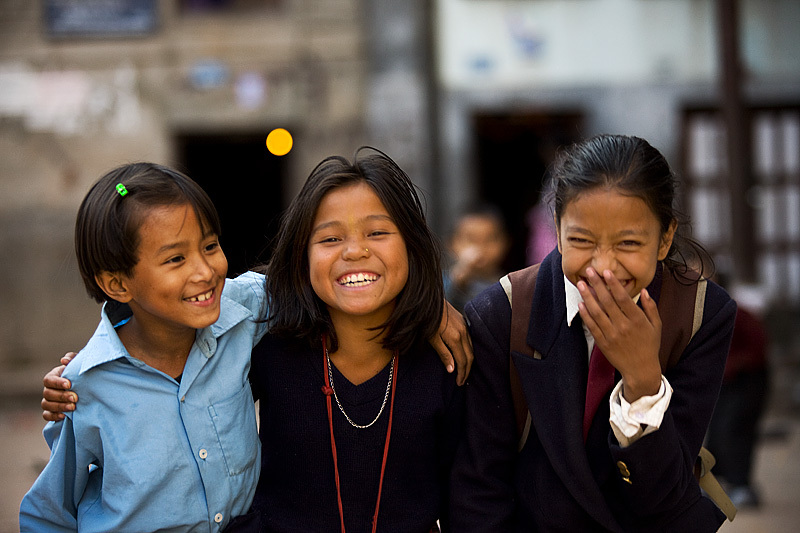 There's little else in the world that makes me smile as easily as when Nepali children display their happy nature. If you're ever feeling down, hop on a plane and make your way to Nepal. The second happiest children on earth (after Cambodian kids) are sure to brighten up your day. Then again, if you can afford to take a plane on such a whim, you probably have doctors already prescribing the best legal pharmaceuticals to get you happy quickly. In which case, ask for Xanax in chewable form! 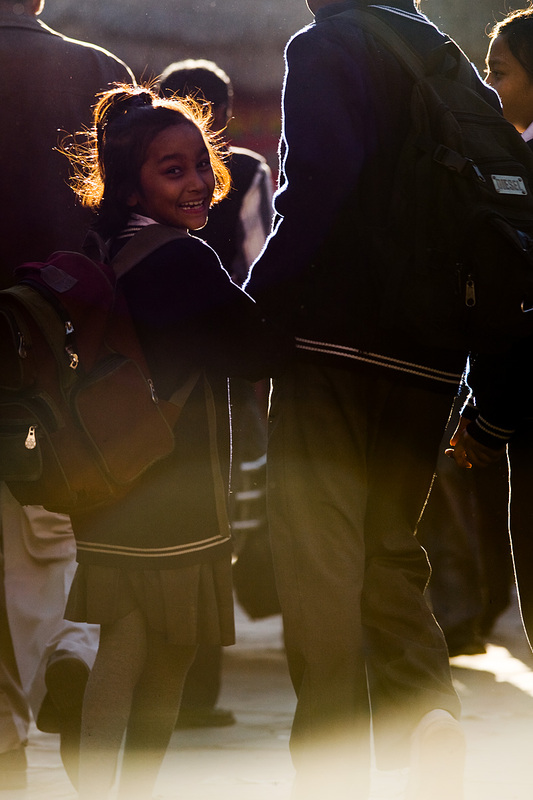 A girl reacts to my camera on her morning walk to school. Here's a lesson for all you boys and girls starting out in photography these days. If you can afford the archive space, try not to throw any of your photos away. As my Photoshopping and general photography skills grow, my idea of a bad picture has evolved. Initially, when I took this photo years ago, I'd written the lens flare and noise off to inexperience. Still, for whatever reason, I didn't throw the photo away. Lucky for me. Now I look at this photo and love it because of the same reasons I initially wanted to throw it away. I'm finding that as I get closer to achieving technical perfection of images, I increasingly want to intentionally create technically imperfect images that have an element of soul. Like I mentioned earlier, like everything else in my life, my photography is a work in progress as I learn new things day after day.